Extrahepatic portal venous obstruction (EHPVO) is a rare and largely idiopathic pediatric condition in which the prehepatic portal vein becomes thrombosed. While an idiopathic or unknown etiology accounts for approximately 50% of all presentations, EHPVO can also be associated with thrombophilic states such as factor V Leiden mutation or protein C or S deficiencies.1 Early in the disease course, the body compensates for the obstruction via hepatic artery dilation and cavernous transformation of the portal vein, indicating the recruitment of small collateral vessels bypassing the obstruction. However, eventually these compensatory mechanisms fail, leading to portal hypertension and diminished hepatic blood flow. A widely accepted surgical procedure used to effectively bypass the obstruction, reestablish hepatic perfusion, and decrease portal pressures is the meso-Rex shunt. The Rex shunt uses an autograft, commonly the internal jugular vein, to form an anastomosis between the left intrahepatic portal vein and the superior mesenteric vein. This procedure, initially developed in 1992, has demonstrated excellent results, with long-term patency rates approaching 90% and approximately 10% of patients developing stenosis of the surgical graft.2 Historically, conduit stenosis would indicate surgical revision; however, percutaneous intervention is now established as a viable option for shunt salvage. 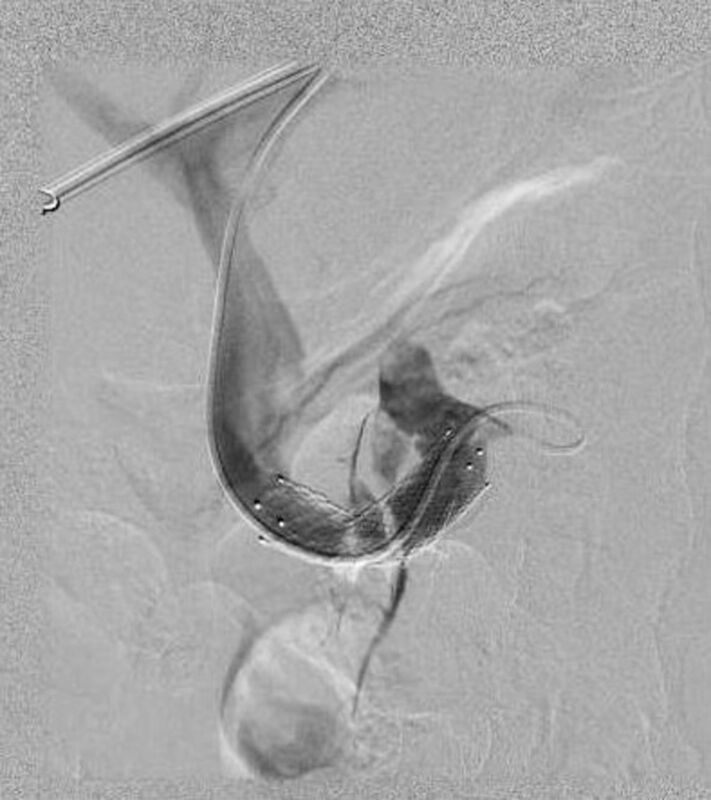 Previous studies have demonstrated the efficacy of both balloon venoplasty and stent placement in patients with Rex shunt stenosis, but limited data elucidate interventional guidelines for patients with recurrent stenosis.2 Balloon venoplasty has been shown to be an effective procedure, but recurrent stenosis develops in up to 20% of patients.2 In cases of recurrent stenosis, treatment options include repeat balloon venoplasty, the use of cutting balloons, stent placement, or surgical revision. Risk-benefit analysis is the driver of medical decision making, so research must be conducted to determine at which point the procedural risk of stent placement in a pediatric patient becomes less than the risk of repeat balloon venoplasty. A 6-year-old female had facial telangiectasias, splenomegaly, and thrombocytopenia on routine physical examination. 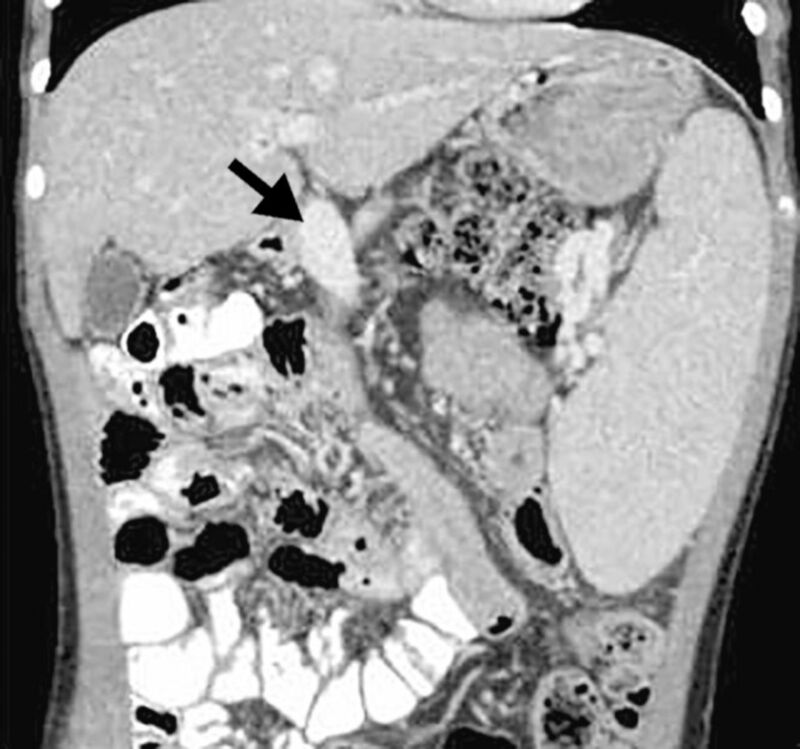 Abdominal computed tomography (CT) and ultrasound demonstrated thrombosis of the extrahepatic portal vein with cavernous transformation. The patient was referred to general surgery for placement of a meso-Rex shunt. The surgical team successfully harvested the patient's internal jugular vein and created an anastomosis between the left portal vein and superior mesenteric vein. Intraoperative imaging demonstrated adequate shunt flow. Six weeks postoperatively, the patient again developed facial telangiectasias and was brought in for examination. Splenomegaly and thrombocytopenia were again found on examination. Figure 1 demonstrates the stenotic Rex shunt on the patient's 6-week follow-up CT.
Computed tomography scan 6 weeks postoperatively shows stenotic development of the Rex shunt (arrow). 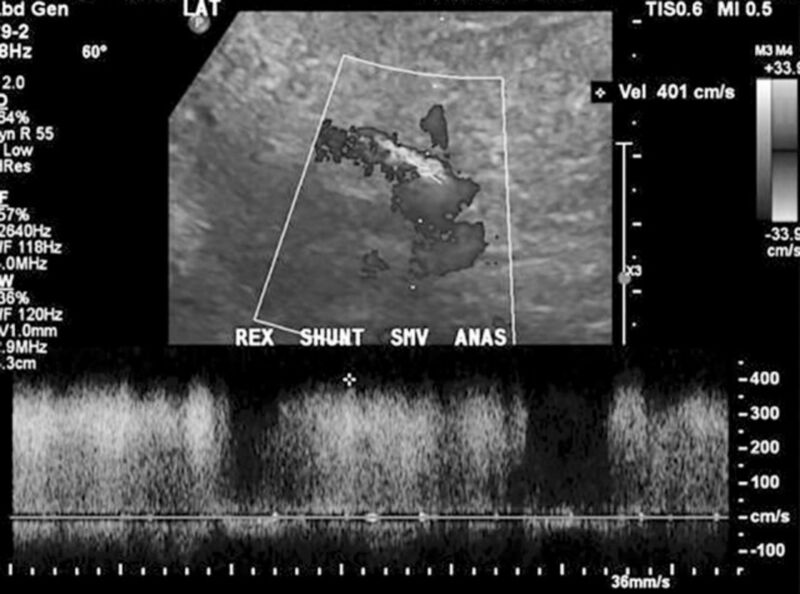 The patient's abdominal ultrasound demonstrated increased velocity at the superior mesenteric vein anastomosis with some reversal of flow in the shunt and occasional bidirectional flow in the left portal vein. Abdominal CT showed stenosis at the proximal and distal graft insertion sites with maintained flow through the shunt. The patient was referred to interventional radiology for percutaneous vascular intervention, and the decision was made to proceed with balloon venoplasty. The right portal vein was entered with a Micropuncture needle (Cook Medical, Inc.) using ultrasound guidance via a percutaneous transhepatic approach. After obtaining access, a GLIDEWIRE (Terumo Interventional Systems) was passed through the area of stenosis, and balloon venoplasty was performed to dilate the stricture up to 6 mm. Subsequent venography demonstrated adequate stenotic relief. The tract into the liver was embolized using coils to prevent bleeding. The patient had no postoperative complications, and her follow-up ultrasound demonstrated no evidence of bidirectional flow in the shunt. Restenosis of the meso-Rex shunt recurred 2 months later. Ultrasound showed progressive splenomegaly with increased velocities in the proximal Rex shunt consistent with evolving shunt dysfunction. A repeat balloon venoplasty procedure was performed, dilating up to 8 mm and resulting in similar improvement of the stenosis. 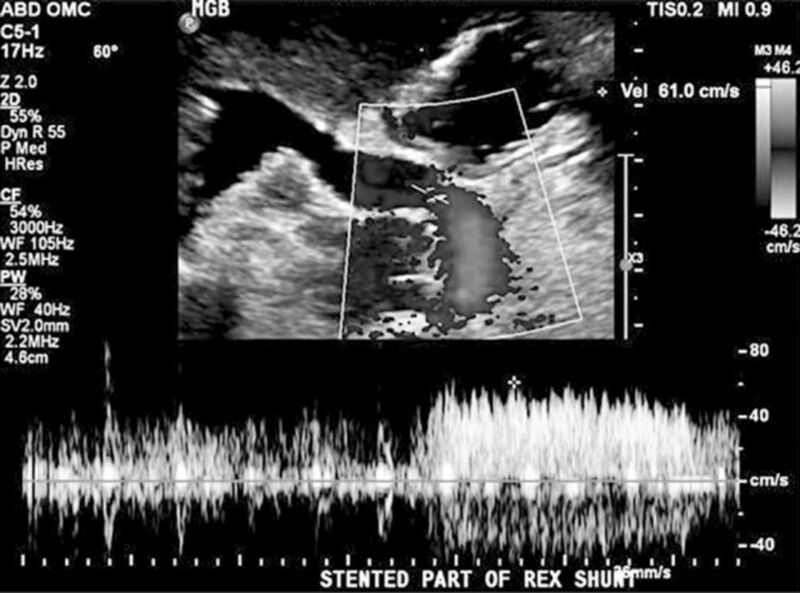 However, 6 weeks after the second venoplasty, repeat ultrasound showed an increase in peak systolic velocity at the level of the superior mesenteric vein/Rex shunt anastomosis and a corresponding decrease in diameter at the level of the anastomosis along with bidirectional flow in the shunt (Figure 2). After extensive literature review, the treatment team decided that because of the patient's recurrent stenosis, the most appropriate method of intervention was placement of a portal venous stent. Follow-up ultrasound demonstrates bidirectional flow within the shunt. Using ultrasound and fluoroscopic guidance, a 21-gauge needle was used to access the patient's left portal vein. The wire was placed into the right portal system. A second needle was used to access the portal vein under fluoroscopic guidance in the right portal system. Access was successful within an anterior branch of the portal vein. Contrast injection demonstrated appropriate positioning. A microwire was advanced centrally using fluoroscopic guidance. An AccuStick sheath (Boston Scientific) was placed. The position was confirmed after injection of contrast. The wire was upsized, and a 7 French sheath was placed. Initial contrast images demonstrated moderate stenosis of the mesenteric anastomosis. A GLIDEWIRE was used to traverse the mesenteric stenosis, and the wire was exchanged for an Amplatz wire (Boston Scientific). Over the Amplatz wire, an 8-mm balloon was used to predilate the stricture using prolonged inflation. Postangioplasty images demonstrated significant improvement in the appearance of the stenosis and improved flow through the shunt. A 10 × 40-mm Zilver stent (Cook Medical, Inc.) was placed in the appropriate position and dilated using a 10 mm × 2 cm balloon catheter. Figure 3 shows intraoperative imaging of the stent deployment. This level of balloon inflation was deemed an adequate endpoint. Final images demonstrated significantly improved flow and no significant residual stenosis. The hepatic tract for the sheath was embolized with a single 0.035 coil. The patient tolerated the procedure and had no complications. Fluoroscopic imaging shows stent deployment. The patient's Doppler ultrasound 6 weeks after stent deployment showed a patent Rex shunt with appropriate flow velocities. The patient had mild splenomegaly, but her spleen size had decreased in comparison to the study conducted prior to stent placement. Sixteen weeks postoperatively, the patient was asymptomatic, and ultrasound demonstrated stent patency (Figure 4). Postoperative ultrasound shows vessel patency and unilateral flow. Although a paucity of data regarding long-term stent patency for portal venous stenosis following meso-Rex shunt procedures is available, the Funaki et al study describes successful stent placement in 12 pediatric patients with stenotic portal veins following partial liver transplantation.4 The average follow-up was 47 months, and at the conclusion of the study, all of the stents remained patent and none required repeat dilatation. These results demonstrate that stents can remain widely patent despite significant patient growth. However, long-term patient follow-up is still required to show continued patency throughout the entirety of a pediatric patient's growth. The majority of portal venous stenosis cases can be effectively treated with repeat balloon venoplasty. The Funaki et al study documented an 83% long-term success rate following 2 or fewer balloon venoplasty procedures for pediatric patients with extrahepatic portal venous stenosis post liver transplant.4 Funaki et al used these data to recommend that stent placement should be used for patients who redevelop stenosis after the second balloon venoplasty. However, 66.6% of patients in the study who were treated with 3 or more balloon venoplasty procedures remained patent at the conclusion of their study. This case documents the treatment course for a patient with repeat Rex shunt stenosis following 2 balloon venoplasties. Because of the vessel stenosis despite repeat balloon venoplasty, the decision was made to proceed with stent placement for long-term management. While long-term follow-up is required to determine the efficacy of this intervention, the short-term outlook for this patient demonstrates that stenoses unresponsive to venoplasty may be amenable to stent placement, thus supporting the recommendation of Funaki et al. Although this report documents only a brief follow-up period, initial results seem favorable with effective stenosis relief and diminishing splenomegaly.